Mixing grout seems like a straightforward endeavor. But it can be a recipe for disaster if the sticky substance that holds your tile in place isn't done correctly. Getting the grout to water mix right takes a bit of knowledge about the basic materials and tools you use to make a seamless tiled surface. Every tile installation uses some sort of grout to keep it in line with its fellow tiles. Grout keeps moisture from getting between and underneath tiles, which could cause serious damage over time. It also prevents cracks and protects the edges of tiles from crumbling. Grout consistency should be equivalent to a creamy peanut butter. There are two types of grout: Sanded and unsanded. If you have tiles that are less than a 1/8-inch thick, choose to use unsanded grout. This allows for better adhesion between the narrow tile, spaces and drywall or subfloor. Any tile that is thicker than that can handle the sanded grout, which will have less shrinkage and better bonding. If you have white residue on your finished grout project, it may not be a problem with the grout. It could be efflorescence. If you use hard water or well water, you may get a layer of fine white dust from the minerals in the liquid that was used. When mixing grout, the right ratio of water to mix will come together easily so the tile can be sealed and set without mess and dust to clean up later. The grout to water ratio is typically 1:1. 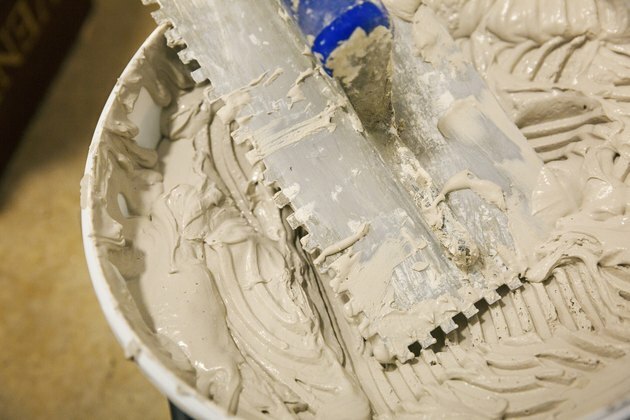 Always check the manufacturer's directions for the grout mix you have chosen to use. Tilt the bucket at a 45-degree angle and slowly add the water in a trickle, mixing as you go. If it is too thick, it could be that the grout hasn't been thoroughly mixed with the water you've already added. When grout is too dry, it is hard to push it down into the joints smoothly. If the grout mix is too wet, it can pile up into joints and crumble when dry. Whether it's bathroom tile grout, kitchen backsplash grout or any wall installation that uses grout to complete the job, the mix should be correct for a long-lasting grip between grout and tile. When applying grout, a polymer additive can be added for spaces that are subject to a lot of damp situations, such as bathrooms. This is meant to cut down on mold growing in between the joints of the tiles and on top of grout lines on shower walls or backsplashes. Kimberley McGee is an award-winning journalist with 20+ years of experience writing for a variety of clients, including The New York Times, Las Vegas Review-Journal Home section and other national publications. As a professional writer she has researched, interviewed sources and written about home improvement, interior design and related business trends. She earned a B.A. in Journalism from the University of Nevada, Las Vegas. Her full bio and clips can be viewed at www.vegaswriter.com. How Thick Should Grout for Tile Be?